The West Coast's biggest motorcycle museum! Along the way, between the ties and the vines, he rode motorcycles -- street bikes, desert bikes, trail bikes and more. 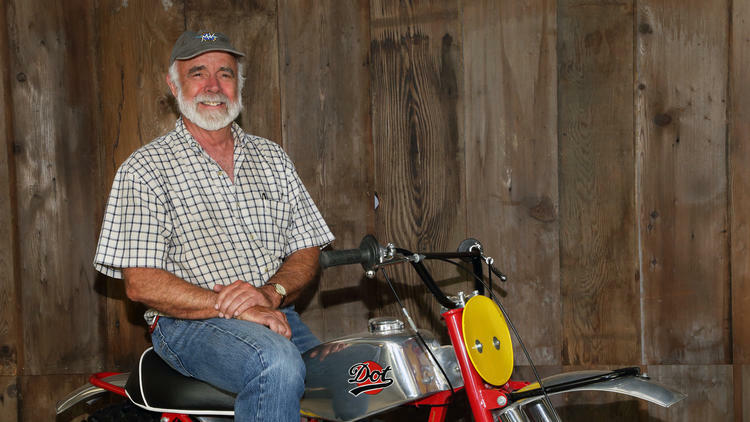 Now the entrepreneur is enshrining his love for the bike by turning his personal collection into the West Coast’s biggest motorcycle museum. Set inside a two-story barn-like building in the center of the village of Carmel Valley, the motorcycle collection shares a stretch of inland coastal road with more than a dozen wine-tasting rooms. Inside are about 140 motorcycles of all varieties and vintages -- Italian race bikes from the 1950s and '60s, European dirt bikes from the 1960s and '70s, British bombers made during the cafe race days, and Indian and Harley-Davidson board track racers from motorcycling’s pioneer period. California is home to some of the world’s richest private motorcycle collections. Some, like Tom White’s Early Days of Motocross Museum near Anaheim, are open to the public only during special events. Others, like Virgil Elings’ Solvang Vintage Motorcycle Museum, are open to the public but keep irregular hours. But with the exception of the small motorcycle exhibit at the Petersen Automotive Museum in Los Angeles, there isn’t a motorcycle collection open to the public to rival the Barber Motorsports Museum in Alabama, the AMA Motorcycle Hall of Fame Museum in Ohio or Wheels Through Time in North Carolina. Mark Hoyer, a vintage motorcycle collector and editor in chief of the respected bike publication Cycle World, said the new museum “will be a perfect gear-head destination” and a bucket-list item for motorcyclists worldwide. The area is already home to the annual Quail Motorcycle Gathering and Pebble Beach-based Concours d’Elegance, which features bikes in addition to classic cars. The historic Laguna Seca racetrack, where cars and motorcycles compete in sanctioned events year-round, is only a few miles away. “California is the biggest motorcycle market in the U.S. and the heart of the two-wheel industry,” Hoyer said. “In every direction [from Carmel] you have magnificent roads and some of the most beautiful scenery in the world. And the museum will be a draw in its own right." Talbott’s Carmel neighbor, fellow motorcycle enthusiast Gordon McCall, agreed. Talbott began his two-wheel obsession in the traditional manner: When he was a boy, he borrowed a buddy’s bike and fell in love with it. Shortly after, he bought a “very used, very beat-up” Honda 50. By the time he went away to Colorado College, he was racing scrambles and motocross and participating in hill climbs and ice racing. Later, he took up street riding, and also long-distance cycling, while building Talbott Vineyards into a well-respected brand. He sold the company to E&J Gallo Winery, divesting himself of his winery, tasting rooms and 525-acre Sleepy Hollow vineyard, last August. The 5,000-square-foot Carmel Valley space will contain replicas of every bike that Talbott ever raced, and a lot of models he raced against -- dirt bikes made by long-gone marques like CZ, Maico, Penton and Sachs, alongside those made by still-extant brands like Yamaha and Husqvarna. But it also reflects his passion for Italian motorcycles, including some made by similarly bygone companies Giro and Gilera, which Talbott acquired when he bought the motorcycle collection of Ojai-based rock photographer Guy Webster. When the displays are complete and the museum opens next month, as many as 22 MV Agustas will be on the museum floor, sharing space with a handful of flat-track bikes, speedway bikes and even a couple of choppers. Richard Varner, a motorcycle collector and racing executive who is treasurer of the board of the Petersen and helped create that museum’s motorcycle collection, called Talbott “truly a historian and truly a devotee of bikes." The museum will also include an area devoted to Talbott family history, a workshop displaying restorations underway, non-motorcycle items such as bicycles and airplane motors, and a shed-like area displaying some un-restored “barn finds,” or motorcycles that were left to rot before being discovered and resurrected by collectors. Others may be more preserved than restored, Talbott said. “Our mission is preservation -- to keep the old ones going and save the ones that can be brought back,” he said. Last year, Talbott promised McCall that he would have the collection open in time for the Quail Motorcycle Gathering, a respected annual show that McCall has held in Carmel for the last eight years. He was hoping to show off his collection to the hundreds of motorcyclists who come into the area for the Quail, even if his museum wasn’t entirely ready for the general public. But as the calendar ticked into early May, Talbott was still building platforms for featured bikes and hadn’t decided on the price of admission -- or even, after looking at other museums, whether he’d charge one at all. Talbott said the collection would probably be open to the public sometime in June. 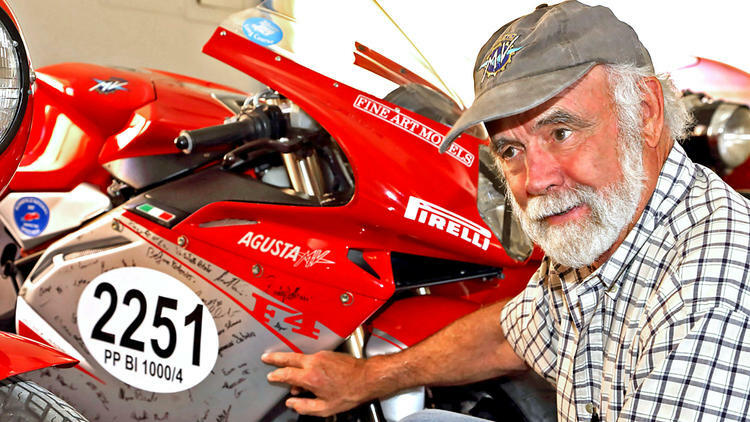 Meanwhile, keeping his promise to McCall, he was looking forward to having his museum be an official stop on the Quail Ride, a 100-mile circuit around the Monterey Peninsula held a day before the Quail motorcycle show. But he sounded equally excited about a week-long off-road trip he was planning to take from Mexico to Wyoming in July. 307T, Tripledij and DarthVader like this. Virgil's Solvang Museum is a bucket list item too. beansbaxter and 307T like this. There was an Africa Twin race bike on display at the Lemay Museum during the Vintage Motorcycle Festival last weekend. I wonder if it was the same bike as the one pictured in the article.